3340 Star Wars #1 is a Classic Star Wars set released in 2000. 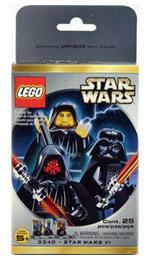 It features Darth Vader with a red lightsaber, Emperor Palpatine with a walking stick, and Darth Maul with a dual lightsaber Minifigures. The name of the set is often debated even though it is officially listed as 3340 Star Wars #1. 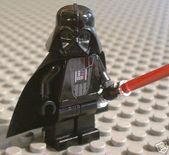 On Peeron.com, it is listed as 3340-1: Emperor Palpatine, Darth Maul and Darth Vader but in the LEGO Star Wars Visual Dictionary it is listed as Sith Minifigure Pack (set 3340). Facts about "3340 Star Wars #1"
This page was last edited on 12 January 2016, at 19:33.